A Loyalist parade on Easter Sunday has been re-routed as it would pass the spot where a Catholic priest was spat on last year. Canon Tom White was assaulted outside St Alphonsus' Church in Glasgow's London Road during the annual Orange Order Boyne march last July. Bradley Wallace, 24, from Uddingston, was convicted of the attack in January. After considering the application, Glasgow City Council confirmed the Easter march would be re-routed. 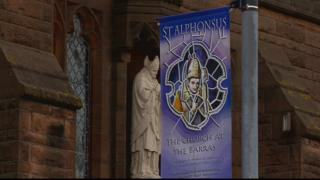 The Apprentice Boys of Derry (Bridgeton) were due to pass St Alphonsus' Church as part of the route. Supt John McBride told the council's public processions committee the force had received highly graded intelligence that counter protests were planned. As a result the force would have had to boost officer numbers from 20 to more than 100, as well as draft in mounted and public order officers. A total of 81 submissions were made expressing concerns about the proposal, including one from an individual who expressed fears for their own safety. The Apprentice Boys, who said they had used the route for 10 years without incident, asked for an afternoon meeting to arrange legal representation but their request was declined. The committee heard a similar march passed the church without incident in February but increased religious activity on Easter Sunday was a identified as a cause for concern. Orange marchers were forced to re-route last year's Remembrance Day parade away from a church in Glasgow's east end amid fears of violent clashes. And last week the Catholic Church called for a planned Orange Order parade on 6 July to be re-routed as it would pass the spot where Canon White was spat on. The Orange Order has applied for marchers to take part in 6 July parades across the city - with members from the Orange And Purple District 37, Orange And Purple District 40 and Rutherglen Orange And Purple District 20 groups due to pass St Alphonsus' Church as part of the route.